Benchmark Media Systems, based in New York State, have established an enviable reputation for their high-quality headphone amps, preamps and digital converters. The company were amongst the first to adopt a very clever jitter-busting technique which uses sample-rate conversion to isolate inherent interface jitter from the converter's own independent local clock, while also running the D-A at the optimum high sample rate. This technique, which Benchmark called 'Ultralock', was introduced in the DAC1 D-A converter and headphone amplifier, which I reviewed in SOS July 2005. I was so impressed I bought one and still use it regularly as a 'benchmark' for evaluating other manufacturers' converters! Technology marches ceaselessly onwards, though, and the DAC1 has been enhanced over the intervening years. For example, the DAC1 USB added a 24-bit, 96kHz USB input, while the DAC1 Pre introduced a stereo analogue input and upgraded audio electronics. The more hi-fi orientated DAC1 HDR enhances the DAC1 Pre's facilities and features with full remote controllability, including a motorised ALPS volume knob. Although the DAC1 product line remains in production, a newer DAC2 model is now available, in both digital input only (DAC2 D) and remote-controlled full preamp (DAC2 HGC) versions. The latter is the specific subject of this review. It is a total redesign from the ground up and is claimed to outperform the previous generation DAC1 in every respect: lower noise and distortion, a better asynchronous USB interface, improved 'UltraLock 2' jitter isolation and a new innovation of internal headroom above 0dBFS to accommodate inter-sample peaks. It also features a clever hybrid gain control (accounting for the 'HGC' in the product title) whereby analogue inputs are attenuated with a motorised analogue potentiometer, and digital inputs are attenuated by a 32-bit digital attenuator, which is controlled by the same rotary pot. 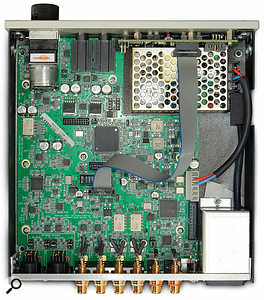 The actual D-A conversion (which can also handle DSD streams) is performed by the latest ESS Technology 'SABRE32' reference DAC chip, in a configuration that differentially sums the outputs of four balanced D-A converters together to maximise linearity, signal-to-noise and dynamic range performance. The rear panel plays host to an array of analogue and digital I/O, including three pairs of stereo analogue outputs: one on balanced XLRs and the other two on unbalanced phono connectors. Measuring 249 x 44.5 x 216 mm, the half-rack width, 1U-high DAC2 is compact and shares the same form factor as Benchmark's previous model. The buyer has a choice of plain or black aluminium front panel and a rackmount adapter plate is available. Its rear panel is busier than the original DAC1's, of course. The primary balanced stereo analogue line outputs are provided on XLRs, along with two sets of stereo unbalanced outputs on RCA/phono sockets. The nominal output level from the XLRs can be adjusted via internal jumpers and the DAC2 ships with 10dB attenuation, but alternative settings of 0dB or 20dB attenuation are also available, so that the drive level to external amplifiers or active speakers can be optimised, placing the volume control in the top half of its range for normal listening. Both the balanced and unbalanced outputs employ high-current buffers capable of driving very long cables with negligible loss. The DAC2 HGC is a fully fledged preamplifier with two stereo unbalanced analogue inputs (on RCA/phono sockets), as well as four S/PDIF digital inputs (two via TOSlink optical and two via RCA/phono sockets) and an asynchronous USB port. The coaxial S/PDIF inputs will accept AES3, AES3-id and SMPTE 276M data streams too via suitably wired cables, and although Dolby Digital and DTS formats cannot be decoded the data can be passed through when the 'HT' mode is selected (see below). ADAT signals are not supported. More internal jumpers allow the second coaxial S/PDIF input (D4) to be reconfigured, if required, as a digital pass-through, outputting the selected digital input. All of the digital inputs, including the USB port, benefit from the UltraLock 2 jitter reduction system, and so all digital inputs have identical performance — essentially with unmeasurable jitter! The DAC2 features an internal universal mains power supply and a bi-directional 12V trigger socket can both send and receive remote power on/off command signals to and from other hi-fi equipment. The front panel is also a lot more involved than that of the DAC1. The headphone output sockets and aluminium rotary volume knob are much the same, but instead of a simple toggle switch there are five push buttons and 17 LEDs. The buttons switch the unit between on, standby and off, dim or mute the outputs, flip the polarity of the digital signal, and select the required input source. LEDs illuminate to identify the selected input source, its word length and sample rate, and the DSD or USB modes. The level of dim attenuation is user-adjustable via the remote control and the volume fades rapidly when entering or exiting the Mute mode, rather than just switching on or off. The DAC2 HGC also incorporates a Home Theatre (HT) mode, in which the selected input is passed through at unity gain. The idea is that the front left/right channels of a multi-channel player can be passed transparently through the DAC2 HGC and on to a home theatre system. The headphone amp is the same renowned HPA2 design employed in the DAC1, but in this incarnation the left headphone socket incorporates a useful switching function that mutes the rear-panel analogue outputs (this can be disabled via internal jumpers). The right-hand socket doesn't include the switch function, and so the user can choose whether the rear-panel outputs mute or not by picking which headphone socket is employed. More internal jumpers adjust the headphone amplifier gain, with a default attenuation of 10dB. Alternative settings of 0dB or 20dB of attenuation can be selected to suit different headphone sensitivities and listening preferences. The intention is to ensure the volume control operates in the top half of its range for normal listening levels. The supplied infrared remote control unit is a custom design with buttons for on, off, dim, mute, volume and input source selection. Ever wondered just how complicated a DAC could be? The ESS DAC chip has the ability to accommodate and decode Direct Stream Digital (DSD) data streams via any of the digital inputs, including the USB port (See the 'DoP' box), and also provides some useful signal processing functionality, with a 32-bit signal path and 64-bit accumulator. This DSP provides digital attenuation for level adjustments on digital inputs, as well as introducing headroom in the D-A converter to accommodate inter-sample peaks. Most converters clip at 0dBFS, and if the audio signal samples reach this the reconstructed audio waveform can often be higher, typically up to about +3dBFS. This can cause clipping within the oversampled digital filtering which is an integral part of delta-sigma conversion (as well as in format conversion codecs like MP3 and AAC). Since mastering engineers are unable — or unwilling — to maintain a sensible headroom margin in commercial CD and download releases, Benchmark Media have taken the very sensible decision to build in a 3.5dB headroom margin prior to conversion in the new DAC2. This is a ground-breaking first in a commercial DAC, as far as I'm aware. Dynamic range isn't compromised because the ESS SABRE32 converter employs a proprietary '32-bit hyperstream' delta-sigma modulator and noise shaper, providing a substantially greater dynamic range than any other currently available delta-sigma converter. The UltraLock 2 jitter reduction system is a revision of the approach taken in the DAC1. It employs the sophisticated technology built in to the SABRE DAC chip, which cleverly separates the embedded clocks on incoming S/PDIF or USB signals from the DAC's local reference clock. The result is that interface jitter is essentially eliminated completely — certainly the DAC2 can tolerate source jitter far in excess of the AES recommendations and maintain an artifact-free noise floor comfortably below -140dBFS. The USB interface can be used in the default USB 1.1 mode for resolutions up to 24 bit/96kHz as a driverless plug-and-play system with Mac OS X or Windows (XP, Vista, 7 or 8) platforms (the USB and X2 LEDs illuminate to indicate this mode). However, if switched to the USB 2.0 mode, resolutions of up to 24 bit/192kHz and DSD can be supported. This is activated by pressing and holding both input select buttons so that the USB and X4 LEDs illuminate. With Mac OS X platforms this mode is still driverless, but for Windows a driver, available from the Benchmark Media web site, is required. The 70-page manual provides comprehensive explanations of the converter's technology, configuration and operation, and there are 23 pages devoted to specifications and test plots. Very few audio equipment manufacturers publish such complete and precise information, and it's very reassuring that Benchmark have such confidence and pride in their designs. I put the DAC2 HGC through a wide range of bench tests using an Audio Precision analyser, all of which confirmed the veracity of the published information. In terms of operating levels, as it ships from the factory (and with the gain control at maximum) the DAC2 HGC provides +13dBu at the balanced outputs for a full-scale 0dBFS digital input. With the output attenuator jumpers set to 0dB, the maximum output rises to +23dBu, while the internal analogue clip level is a generous +30dBu. The maximum unbalanced analogue input level is a very generous +14dBu, and the maximum gain to the balanced output (volume control at maximum, factory 10dB pad engaged) is +6dB (or +0.5dB to the unbalanced outputs). Modern D-A converters are extremely good, but the test that really sorts the exceptional from the average is the AES17 dynamic range test. Typical budget converters manage a dynamic range figure of around 115dB (A-wtd), and amongst recent high-end converters that I've tested the D-A sections of the Focusrite Forte and UAD Apollo interfaces both scored 118dB (A-wtd), while the Lynx Hilo's D-A managed a very impressive 120.5dB (A-wtd). The new Benchmark DAC2 HGC's figure is an outstanding 125dB (A-wtd) — and that level of performance is maintained across the board; all of its specifications are exemplary. Confirming just what a step forward the DAC2 is from its predecessor, my own DAC1 scores 117.5dB (A-wtd), and its signal-to-noise ratio is about 10dB worse than the DAC2 HGC. I plumbed the DAC2 HGC into a number of different systems, replacing my usual monitoring controllers (Benchmark DAC1, Grace Design M902, Bryston SP1.7, Crookwood M1) without problem. I listened to a wide variety of commercial material sourced via CD, DVD-A, SACD and Sonus media servers, as well as from my own recordings and mixes on SADiE and Reaper. The DAC2 HGC is very straightforward to use, both directly from the front panel and via the remote, which is nicely weighted and balanced, but it does run quite warm and takes a good 30 minutes to reach its optimal operating condition (the DAC1 is the same in this respect). The inclusion of a Dim function is very welcome, and although the motorised volume control does make some acoustic noise when moving, it is not obtrusive. The most noticeable and dramatic sound improvement over all of my other D-A converters was the complete absence of peak distortion when listening to commercial CDs! Most current and 're-mastered' music contains significant inter-sample peaks, and that inevitably cause distortion to varying degrees through clipping of delta-sigma converter filters. Although this distortion can be quite subtle (or sometimes quite blatant), once recognised it detracts from the music at a subconscious level and I find it really irritating! I've been avoiding the problem for a while now by applying 6dB of digital attenuation in my Sonus music server interfaces to create a headroom margin prior to D-A conversion. However, the DAC2's 3.5dB of internal headroom means it sounds sublime even when receiving a direct S/PDIF signal from a CD player. This feature alone makes it worth the asking price, as the improvement in overall sound quality is quite dramatic! My Crookwood mastering console allows different converters to be compared directly. When auditioning audio without inter-sample peaks, I noticed a subtle improvement in overall detail and clarity between the DAC2 HGC and DAC1, with fractionally cleaner and quieter backgrounds, and a smoother top end. As is so often the case, we're in the world of rapidly diminishing returns here, and the DAC2 HGC is almost twice the price of the original DAC1. Nevertheless, it does manage to deliver a soundstage that I perceived as being slightly more lifelike, even more transparent, cleaner, quieter, more polished and, ultimately, more involving to audition. Benchmark claim it sounds more 'analogue' and, actually, it does! The original DAC1 was aimed squarely at professionals, but was subsequently embraced by the audiophile market. It remains an excellent D-A converter, and its ability to completely isolate interface jitter sets it apart from most D-As, including some of the much more costly models. However, digital audio technology continues to make incremental improvements, and in the eight years since I reviewed the DAC1 the state of the art has clearly advanced. The DAC2 HGC is undoubtedly a major step forward in technical performance compared to its forebear and, although it costs almost double the price of a DAC1, it does also offer a lot of additional features and facilities. I'm trying to resist reaching for the credit card, but it's proving very difficult. The DAC2 HGC has a fairly unusual feature set and so directly comparable alternatives are difficult to find. However, the most obvious is Benchmark's DAC1 Pre which has similar features at a lower cost, and despite its previous-generation electronics it is still a very strong performer. The Grace Design m903 is also comparable in features and price to the DAC1 Pre. More closely priced to the DAC2 HGC is the Lynx Hilo, but this unit includes a stereo A-D, more digital I/O and a lot more signal processing and metering facilities. The build quality of the DAC2 HGC is excellent, as you'd expect at this price. The electronics are predominantly surface-mount devices (SMD) on a single, six-layer PCB, with a small daughter-board for the front-panel buttons and LEDs. The power supply is a compact switched-mode design in a separate screening enclosure, and each critical sub-section of the DAC2's electronics employs its own local power-supply regulation to minimise interaction and unwanted power-rail noise. Naturally, the DAC2's circuitry is radically different from that in the DAC1, although the basic concepts are the same. The four S/PDIF inputs are handled by a Burr Brown SRC 4392 sample-rate converter which happens to have four input receivers, and so serves as the S/PDIF source selector in addition to providing input sample-rate conversion to the internal rate of 211kHz, which is almost twice as high as the DAC1's internal system rate. The asynchronous USB input feeds an SMSC 3318 transceiver associated with an XMOS micro-controller. Analogue input and output signal switching is via sealed relays with gold-plated contacts, and Texas Instruments LME 49680 ultra-high performance opamps are employed throughout the analogue signal path. The class-A headphone output drivers are based around Texas Instruments LME 49600 high-current buffer amplifiers (instead of the functionally identical BUF634 chips used in the DAC1). A Xilinx Spartan 6 FPGA provides the DAC2's logic control and DSP centre, while an ESS 9018 SABRE32 eight-channel reference DAC provides the digital audio conversion and further jitter reduction. Although intended for surround-sound applications, Benchmark's implementation of this SABRE converter sums four output channels together differentially, to provide each side of the stereo output. Combining the outputs in this way removes common-mode distortion components generated within the DAC and enhances the dynamic range and signal-noise performance considerably. Sony's Direct Stream Digital (DSD) is a special variation of PCM digital audio. It employs a single bit instead of 16 or 24, but runs at a much higher sample rate (64 x 44.1 kHz = 2.8224MHz as standard, with a higher 5.6MHz rate as an option). The DSD format is employed on Super Audio CDs (SACDs) and is increasingly for audio download files. Steinberg's ASIO 2.2 interface can stream DSD files natively, but a new format called 'DSD-Over-PCM' — or 'DoP' — is proving more popular because it's more flexible. DoP is essentially a DSD data stream that's packaged to look like a standard 24-bit/176.4kHz PCM signal. Other audio formats, such as Dolby Digital and DTS multi-channel data streams, are packaged in broadly similar ways. Typically, DoP is downloaded as a WAV file and can then be transported over any system that can handle normal quad-rate PCM audio data, including USB, Firewire, TOSlink, S/PDIF, AES3 and HDMI. In all cases, 16 bits of pure DSD data are packaged at the LSB-end of a standard 24-bit PCM data frame, with the top eight bits being a unique identifying header that has to be removed by the decoder before playback. Packaging the DSD data at the LSB-end means that if the receiving device fails to recognise and decode the DSD stream correctly, the result is benign and sounds like low-level (-50dBFS), noisy music. The quad (176.4kHz) sample rate is needed to achieve the required 2.8MHz DSD sample rate since there are 16 bits per frame (16 x 4 frames = 64 times faster than 44.1kHz!). The number of computer audio file players and D-As that accept DoP, and which can handle the encapsulated pure DSD data stream, is growing. Early adopters included Foobar, JRiver, and Pure Music, while Mytek and Benchmark are amongst the compatible D-A converter manufacturers. The DoP format is an open standard and detailed technical information can be found at www.positive-feedback.com/Issue60/dsd_usb.htm. 3.5dB headroom in converter to accommodate inter-sample peaks. Same form factor, operating principles and headphone amp as original DAC1. Unity-gain digital and analogue pass-through modes. Configurable attenuators for XLR and headphone outputs. This kind of quality costs! Building on the success and innovative technologies of the DAC1, Benchmark Media Systems' new DAC2 HGC applies the latest generation of sophisticated converters and other technologies to deliver significantly better performance and versatility. Recommended. Benchmark Media +1 800 262 4675.